I got a lot of attention from the workers setting up the Auto Show when I delivered the car. One guy asked if he could sit in it. I said sure, and he posted the picture.. 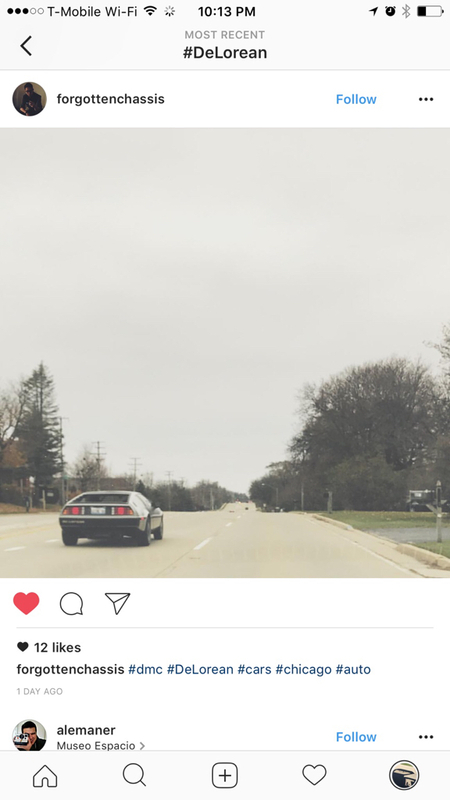 I'm not sure that the second photo is me, but it's tagged "Chicago" and the license plate looks like a blurry version of my plates. Edit: not sure how to post instagram videos, so here's the link instead. I'm in mobile and edited the post wrong. YAY! I've been on Instagram and The Chive. A DeLorean is as it seems; devoid of creature comforts and cup holders. No element distracting driver from road. Gaudy. Elegant. Completely unapologetic. Fully loaded with all the amenities of a bygone era and, for that, it does take one back in time.